Akrapovic "Slip-On" Mufflers for Yamaha VMX1700 "V-Max"
The Akrapovic "Slip-On" Mufflers were one of the first ones, if not the "First" one on the market for the GEN2. 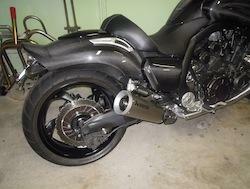 They literately slip on out-of-the-box, to the OEM "Cat", with absolutely NO modifications to the mufflers or the bike itself. In addition, at the time of release, they also slipped right on to "Mike's X-Pipe", which also was one of the first along with UFO's midpipe to hit the market. The Akrapovic midpipe is also available separately and is one of the choices available today since Mile's X-Pipe is no longer being manufactured. 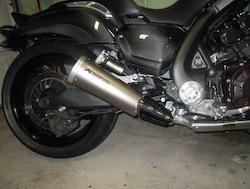 The Akrapovic "Slip-On" Mufflers are Manufactured by Akrapovic, D.D..